We cordially invites you to attend the first public lecture on Javanese Diaspora held in Faculty of Cultural Science, Universitas Gadjah Mada, Yogyakarta, Indonesia. This public lecture is held in collaboration with Department of Cultural Anthropology, Faculty of Cultural Science Universitas Gadjah Mada. Will be speaking, Mrs. Hariette Mingoen, 3rd generation Suriname-Javanese and Mr. Soehirman Patmo, both from the Netherlands. 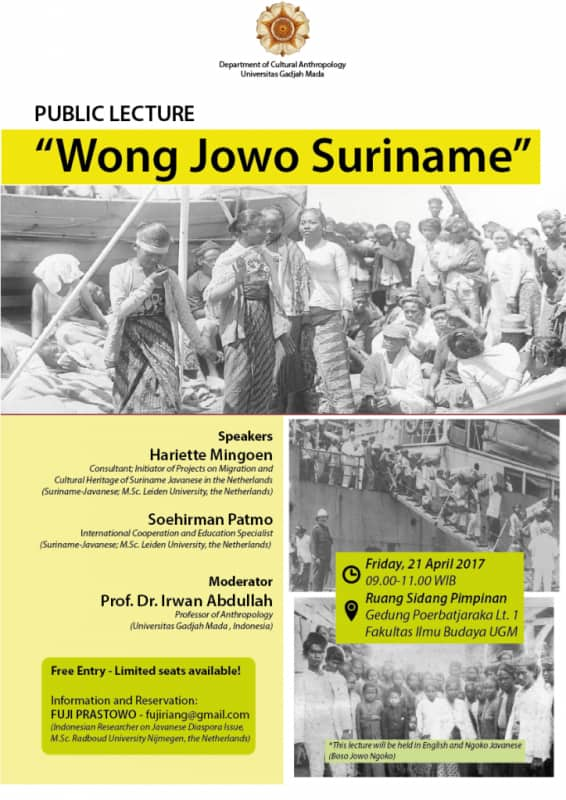 This public lecture will be moderated by Prof. Dr. Irwan Abdullah, professor of anthropology from Universitas Gadjah Mada. Only limited number of seats are available, so reserve your seat soon. More information on reservation may be found on the poster above.